(March 12, 2014) — Encouraging sustainability practices and awareness of environmental issues is at the heart of a new Living Learning Program (LLP), which will make its debut this fall at the University of Kentucky. Greenhouse is a partnership between the College of Agriculture, Food and Environment (CAFE) and the College of Arts and Sciences (A&S). The co-directors from CAFE are faculty members Carmen Agouridis, Department of Biosystems and Agricultural Engineering, and Mary Arthur, Department of Forestry. The A&S faculty serving as co-directors are Shannon Bell, Department of Sociology, and Alan Fryar, Department of Earth and Environmental Sciences. "Students of all majors are welcome, not just science majors," said Agouridis. "Greenhouse is for students with an interest in environment and sustainability — two topics that are transdisciplinary." 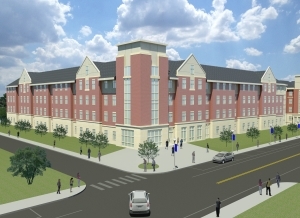 Greenhouse will be located in the new Woodland Glen II residence hall currently under construction and will begin in August. Both freshmen and sophomores are invited to be a part of the community. The directors are striving for a split of 75 percent freshmen and 25 percent sophomores. While Greenhouse is open to freshmen and sophomores only, juniors and seniors are welcome to apply to serve as peer mentors. "Students in Greenhouse will enroll in a connected two-credit hour course during the fall semester (AS 100, "Pathways and Barriers to Environmental Sustainability") and a one-credit hour course during the spring semester," Fryar said. "All four directors will participate in teaching the two-credit course which will introduce the principles of environmental sustainability in the context of the campus, local and global communities." In the spring semester, the plan calls for each director to guide a seminar on a specific environment and sustainability topic. Another key component of the Greenhouse program is co-curricular activities. "We are developing opportunities for the students to network with faculty, staff, professionals and community members who are working in environmental and sustainability areas," Bell said. "Students will have opportunities to attend weekly chats, participate in tours and field trips, interact with guest speakers and more. One of our main goals is for students to become engaged members of the UK and Lexington communities." Woodland Glen II is a LEED-Silver building. LEED stands for Leadership in Energy and Environmental Design. It is a rating system for "green" buildings that focuses on design, construction and operation. There are four levels: certified, silver, gold and platinum. Points are given based on factors such as site sustainability, water efficiency, energy efficiency, types of materials used, and indoor environmental quality. The enrollment process is currently underway, and any interested students are welcome to contact the faculty co-directors, or Adrienne McMahan (Adrienne.mcmahan@uky.edu), with any questions. "We are all excited to be a part of this new project," Arthur said. "We are looking forward to engaging a community of UK students as we focus on the environment and pathways toward greater sustainability." Watch the video below for a complete look at UK's efforts to add even more options for students to live and learn on campus. Additional information on the new Greenhouse LLP is available here. Celebrating its 25th year on campus in fall 2014, the Living Learning Program at the University of Kentucky provides students with an environment to learn where they live and to live where they learn. The Division of Student Affairs Office of Residence Life, creators of the program, collaborated with academic and other student success partners to compliment the classroom experience. Through Living Learning Communities and Residential Colleges, UK offers students an opportunity to live and learn together in an integrated academic residential environment. This dynamic residential experience offers specialized programming, interactions with UK faculty and staff, and a supportive community that focuses on student success. The program has grown exponentially in recent years with 965 students participating in 13 programs this year. Six more programs will be added in fall 2014, nine times more than in 2008. For more information, click here.